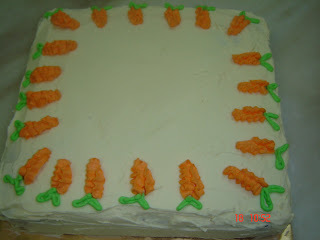 Carrot cake frosted with creamy cream cheese topped with simple deco.Sometimes less is better.. 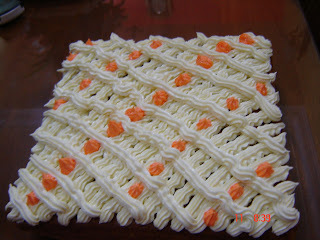 This carrot cake weight about 2kg was ordered by my daughter's teacher Puan Wan. I mixed carrot & roasted almond in the ingredients that makes it taste different from other cakes. Actually I wasn't ready to bake this cake coz my eldest daughter is struggling in d exam hall for her UPSR...if not mistaken it was on the 2nd day of UPSR. Mula-mula agak hesitate nak terima order tapi bila memikirkan jasa cikgu mendidik anak i..i just said okay je...So this is it!! Really hope that she enjoyed eating the cakes with the whole family as she said that carrot cake is their favorite one. Chocolate cake weight 1.5kg ordered by my sis in law, kak ngah for her kids Adam & Farhana. No specific theme given..so i just play around with choc chips to make it 'happening' and they just love it. Thanks for the order and waiting for the next one this year...my dear.